Below you will find the Ikebana Flower Sand Tray Example. 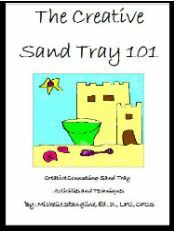 See more information in the Creative Counseling 101 Sand Tray Therapy eBook below for this activity. *Note: There is no right or wrong way to do Sand Tray Therapy for your sand tray therapy clients. Do not get caught up in all the "rules" you hear about sand tray therapy. Relax and go with the flow, it's okay! Basically, you are a licensed therapist, or under supervision. 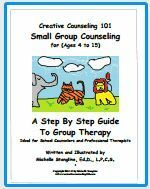 You are here at Creative Counseling 101 to learn more about sand tray therapy. Seek other venues of face to face trainings in your area as well to continue to seek knowledge in sand tray therapy. You are on your way to becoming a great sand tray therapist and helping your sand tray therapy clients! However, there is a wrong way for the sand tray therapist to handle the client’s sand tray in sand tray therapy. 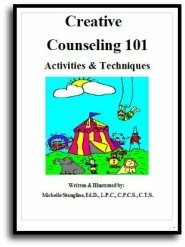 Harm can occur from the sand tray therapist to the sand tray therapy client if the sand tray is misused. Translation is also an area of concern in sand tray therapy. Be careful how you translate a sand tray in sand tray therapy. The sand tray therapy client is always the "ultimate translator". Do not ever tell a sand tray therapy client they are doing a Sand Tray wrong!!! The Sand Tray Therapy Warm up Level: The client shows an interest in sand by playing with the Zen Garden, or Sand Tray Therapy tray. The sand tray therapy client may try working with the miniatures in the doll house or in a miniature world. If there is an interest shown, the sand tray therapist explains how the client can use sand tray therapy and sand tray therapy miniatures. The therapist invites the client to try out the “Sand Tray”. If the sand tray therapy client declines this is okay. This does not mean anything. It just means the client does not like sand. 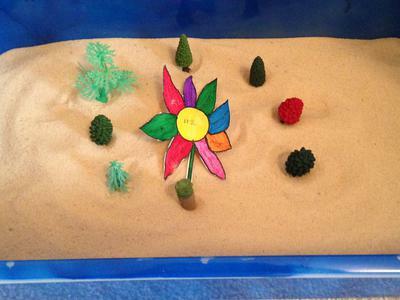 The Sand Tray Therapy Creation Level: The sand tray therapy client takes the sand tray therapy miniatures and begins to build a sand tray therapy world. The sand tray therapist sits down with the sand tray therapy client in front of the sand tray. The sand tray therapist draws a picture of the sand tray and makes notes of all sand tray therapy miniatures (especially the first five). The sand tray therapy client has been instructed to tell the sand tray therapist when they are finished. When the sand tray therapy client states he/she is finished the sand tray therapists ask if they would like to add or take away any miniatures. Once the sand tray therapy client is satisfied, the therapist asks him/her to "just be" with the created world for a few moments. The Sand Tray Therapy Bonding Stage Level: After the sand tray therapy client has stated they have “finished sitting with the world,” the sand tray therapist ask if he/she can join the sand tray therapy client with their world. The sand tray therapist moves in closer to join the client’s world. 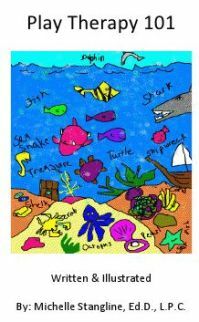 Learn even more about Sand Tray Therapy with Dr. Stangline's eBook based on her Graduate Sand Tray Therapy Class at Mercer University! 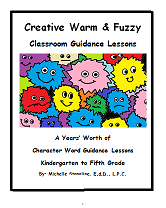 While not an online class, it is the exact replica of her graduate sand tray therapy class with step by step directions for you to follow at your own pace. The Sand Tray Therapy Exploring Stage Level: The sand tray therapist puts on the “detective hat” and asks many questions about each miniature and the relationship to the other miniatures in the world. The sand tray therapy client will translate for the sand tray therapist. End the Exploring Stage Layer with positive hope for the sand tray therapy client. The sand tray therapist jots down quick notes on the picture drawn. 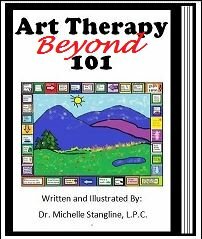 The Sand Tray Therapy Ending Stage Layer: Before leaving the world the sand tray therapist will always end the sand tray therapy session with some type of a positive or "hope" statement. The sand tray therapist explains that it is time to leave the world until the next session. Give the sand tray therapy client a couple of minutes to leave the world. The sand tray therapist may ask if a photo can be taken. If so, a copy of the photo is offered to the sand tray therapy client. The Sand Tray Therapy Breakdown Stage Level: This is done after the sand tray therapy client leaves. Do not touch the miniatures in front of the sand tray therapy client. This violates client’s boundaries. Of course, the sand tray therapy client can break down their world if they chose to. The Sand Tray Therapy Translation Stage Level: After the sand tray therapy client leaves the sand tray therapist will translate the tray using a Symbol dictionary to try to better understand the client and their chosen miniatures. Remember though, it is always the sand tray therapy client’s translation that is accurate translation.